Long, Carolyn Morrow. Spiritual Merchants: Religion Magic & Commerce. 1st ed. Univ Tennessee Press, 2001. They can be found along the side streets of many American cities: herb or candle shops catering to practitioners of Voodoo, hoodoo, Santería, and similar beliefs. Here one can purchase ritual items and raw materials for the fabrication of traditional charms, plus a variety of soaps, powders, and aromatic goods known in the trade as “spiritual products.” For those seeking health or success, love or protection, these potions offer the power of the saints and the authority of the African gods. 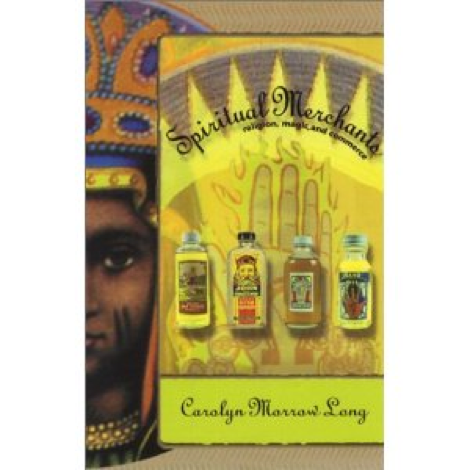 In Spiritual Merchants, Carolyn Morrow Long provides an inside look at the followers of African-based belief systems and the retailers and manufacturers who supply them. Traveling from New Orleans to New York, from Charleston to Los Angeles, she takes readers on a tour of these shops, examines the origins of the products, and profiles the merchants who sell them. Long describes the principles by which charms are thought to operate, how ingredients are chosen, and the uses to which they are put. She then explores the commodification of traditional charms and the evolution of the spiritual products industry–from small-scale mail order “doctors” and hoodoo drugstores to major manufacturers who market their products worldwide. She also offers an eye-opening look at how merchants who are not members of the culture entered the business through the manufacture of other goods such as toiletries, incense, and pharmaceuticals. Her narrative includes previously unpublished information on legendary Voodoo queens and hoodoo workers, as well as a case study of John the Conqueror root and its metamorphosis from spirit-embodying charm to commercial spiritual product.